He joined the Columbia University in 1987 where he holds a joint appointment in Electrical Engineering and Applied Physics and Applied Mathematics. Between 1981 and 1982 he worked at the Rockwell Science Center and between 1982 and 1987 he worked at the IBM T. J. Watson Research Center. During Fall 1986, he was a Visiting Associate Professor with the EECS dept at MIT. 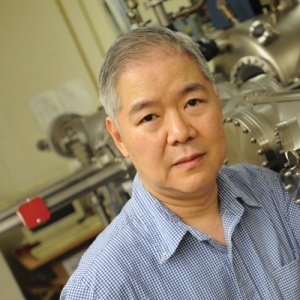 He has contributed more than 300 journal articles in the areas of heterostructure device physics, high speed transistors, semiconductor lasers, photodetectors, molecular beam epitaxy, and surface science. He is a fellow of the IEEE, American Physical Society, and a distinguished lecturer of the IEEE Electron Device Society. He received his Ph.D. and master's degrees in electrical engineering at Cornell University, and the bachelor's degree in physics from the National Taiwan University. He has served on many technical review panels, including the New York State Science and Technology Foundation Center for Advanced Technology program on opto-electronics. “InAsSb-based SLs” Quantum Structure Infrared Photodetectors Conference, QSIP 2018, Stockholm, Sweden, 2018. “Type-II InAs/GaSb superlattices grown by molecular beam epitaxy for infrared detector applications” SPIE conference on Infrared Sensors, Devices, and Applications II, San Diego, CA. 2012. Proc. SPIE 8512, Infrared Sensors, Devices, and Applications II, edited by Paul D. LeVan et al., 2012. “Type-II InAs/GaSb superlattices grown by molecular beam epitaxy for mid and long wavelength infrared detector applications”, International Conference on Quantum Structure Infrared Photodetector, (QSIP) Istanbul Turkey, Aug. 15 - 20, 2010. "High detectivity AlGaAsSb/InGaAsSb photodetectors grown by molecular beam epitaxy with cutoff wavelength up to 2.6 um", 15th International Conference on Molecular Beam Epitaxy, Vancouver, BC, Canada, Aug. 3–8, 2008; J. Crystal Growth, 311, 1893–1896 (2009). "Molecular-beam epitaxy of phosphor-free 1.3um InAlGaAs multiple quantum well lasers on InP (100)", J. Vac. Sci. & Tech. B, v 25, 1090 (2007). Invention of the InGaAsNSb quinternary compound. Li, L.K. ; Turk, B.; Wang, W.I. ; Syed, S.; Simonian, D.; Stormer, H.L., "High electron mobility AlGaN/GaN heterostructures grown on sapphire substrates by molecular-beam epitaxy", Appl. Phys. Lett. 76, 742 (2000). X. Yang, M. J. Jurkovic, J. B. Heroux, and W. I. Wang, "Molecular beam epitaxial growth of InGaAsNSb/GaAs quantum wells for long-wavelength semiconductor lasers", Appl. Phys. Lett. Vol.75, No.2, 178 (1999). Y. Zhao, M.J. Jurkovic, and W.I. Wang, "Characterization of AuGe and AuTe based ohmic contacts on InAs n-channel high electron mobility transistors", J. Electrochem. Soc. 14, 1067 (1997). X. Li, J.L. Jimenez, M.J. Jurkovic, and W.I. Wang, "Novel approach for integration of an AlGaAs/GaAs heterojunction bipolar transistor with an InGaAs quantum well laser, in Optoelectronic Integrated Circuits, Proc. SPIE 3006, pp. 126-133 (1997). I.W. Tao and W.I. Wang, "Strained InGaAs quantum well lasers grown on (111) GaAs", Electron. Lett. 28, 705 (1992). G. Brozak, B.V. Shanabrook, D. Gammon, D.A. Broido, R. Beresford, and W.I. Wang, "Intersubband transitions in piezoelectric superlattices", Surface Science 267, 120-123 (1992). High breakdown voltage AlSbAs/InAs n-channel field effect transistors, IEEE Electron Dev. Lett. vol. 13 (1992). E.E. Mendez, H. Ohno, L. Esaki, and W.I.Wang, "Resonant interband tunneling via Landau levels in polytype heterostructures", Phys. Rev. B43, 5196 (1991). Resonant interband coupling in InAs/GaSb/InAs, J. Appl. Physics, 68, (1990). Band structure engineering for electron tunneling in heterostructures, Beresford, R.; Luo, L.; Wang, W.I. ; IEEE Transactions on Electron Devices, v 36, p 2618, Nov. 1989. L. F. Luo, R. Beresford, and W. I. Wang, "Interband tunneling in polytype InAs/GaSb/AlSb heterostructures" Appl. Phys. Lett. 55, 2023 (1989). L. F. Luo, R. Beresford, and W. I. Wang, "Resonant tunneling in AlSb/InAs/AlSb double-barrier heterostructures" Appl. Phys. Lett. 53, 2320 (1988).